Here is another short video of my couple of days in Hiroshima. Hope you enjoy. Donate: The Telethon Adventurers. Every little bit counts. 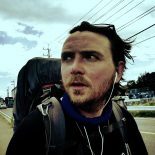 This entry was posted on August 3, 2014 by Robb Saunders in Adventure, Charity, Hiroshima, Japan, Peace Memorial, The Telethon Adventurers, Video, Walking and tagged Adventure, Charity, Hiroshima, Japan, Nomad, Peace Memorial, The Telethon Adventurers, Travel, Video, Walking.